What is so great about paragliding in Iceland? Flying in Iceland gives me sort of an exotic feeling of doing something extraordinary; the whole idea of soaring above sub-polar lava-land somewhere in the middle of the Atlantic gives me a very positive thrill. Sometimes it’s challenging and requires a lot of patience and weather awareness because local elements tend to turn deaf ears to our prayers 😉 As a newcomer I really appreciate the feedback that Icelandic nature gives me while flying (and af course at take-offs) – all those unique landscapes are even more beautiful when seen from above. The lack of trees and the grassy landing fields seem to be made for paragliding pilots. What is your favourite site and why? I find it really hard to point out just one site, it’s simply because you can find a place to launch at almost every slope. I really like the relaxing after-work-flying at Hafrafell, which also serves as a social hub for paragliding pilots, but my real love is to fly where not many pilots have flown before. One such place with huge potential is Skaftafell National Park, where I made my unforgettable flight close to the glaciers – I hope this season I’ll go back there. Iceland is a true paradise for that kind of adventurous flying with almost the whole country covered with unflown sites waiting to be explored. Tomasz Chrapek is originally from Poland but migrated to Iceland on the waves of the winds a few years ago. He is a relatively new pilot and a shooting star, taking third place at the 2010 Icelandic XC League, and one of a small group of hard-core pilots refusing to be grounded by the temperamental Icelandic winter. He is also a skilled photographer, check out his images here. * The featured image is by Tomasz while flying in Ingólfsfjall. Róbert Bragason lives in downtown Reykjavík. He wishes Hafrafell was 2.000 mtr high so he could practice acro every day. If he’s not busy giving locals the gift of free flight you can be sure to hear him belt out a Waahoooooooo! from cloudbase. He is also the guy who was crazy enough to passenger the first ever commercial tandem infinity tumble with Pal Takats: click here to watch the video. * The featured image is by Sigurður Ingi Halldórsson, taken in Hafrafell. Róbert is the blue/white glider in the middle of the photo. What is your favourite site in Iceland and why? I must say Hafrafell because its so close by and when you think you are getting bored of it, it usually surprises you. Not to mention its only a 10 min. drive from my home. Another favourite is Herdísarvík; see breeze, thermals, long ridge, spectacular views with lava, moss, high cliffs. Minus; too far from Reykjavík (hmmm… about 30min. from the suburbs), I have had countless drives out there resulting in no flying. For pilots going to the Western parts of Iceland I recommend Laugar í Sælingsdal and Dynjandi/Fjallfoss, Arnarfirði. Sigurður Ingi Halldórsson, Siggi, is one of our most competitive pilots, with at least 5 years behind him and oh so close to winning the Icelandic XC League in 2008 and 2009. He will frequently be found on or around a mountain top… in almost any condition. * The featured image shows Siggi go XC from Hafrafell. It’s different from other places: the season is very short, the weather is difficult, and the flying is challenging. We have 24 hour daylight in summer and often fly late into the evening. Learning to use the ridge lift, then find and exploit the embedded thermals at Hafrafell gave me skills that were very useful in the alps. The technique for climbing out, finding thermals and then using them was exactly the same I’d learned at home. What is your favourite site (in Iceland) and why? My favourite site is Herdisarvik, because the area is very beautiful, remote and the flying is great. Having 17km of ridge to play with is just luxury. I also like the fact that the takeoff feels realls scary and committing but is actually not at all tough. Timothy William Bishop or Biskupinn is an ex-military aviator who moved to Iceland seven years ago and has around fifty hours’ PG flight time. Biskupinn has written material for this site, click here to read. * The featured image is by Áslaug Rán Einarsdóttir of Tim flying above Skógarfoss. Szczepan groundhandling in the foreground. Hafrafell is my only launchpad in Iceland so far and as the only contender has to be my favorite (I really hope to expand my knowledge of our skies this summer). The obvious advantages of Hafrafell is its frequent flyability, ease of access and being within a half hour drive from anywhere in the Reykjavík area. Though this early in summer the landing area is a bog most of the time you would be hard pressed to get in any trouble finding a spot to land on. Hafrafell also serves as a social hub where one can be sure to meet good people skipping work early to catch the sea breeze. 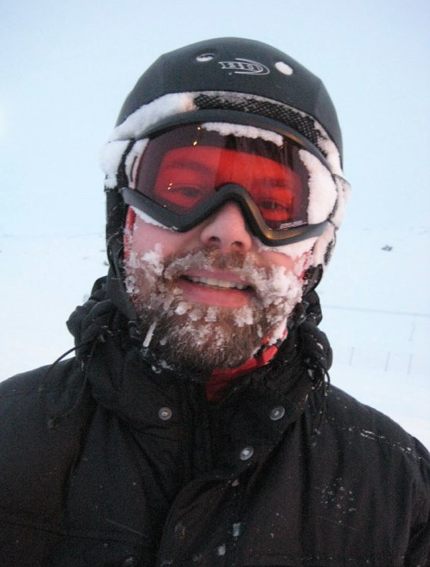 Ágúst Rafnsson lives in Reykjavík and learned to fly in 2009. He learned with Róbert Bragason and Tim Bishop at Fisfélag Reykjavíkur. * The featured image shows Ágúst getting ready for his first flight with instructor Róbert. Because I came by chance in 1972 and in 1973, 1975, … Because I learned to fly in 1988 … Because I wanted to fly to Iceland … Because in 2009 I finally decided … Because local paragliders are really amazing. Because light is more beautiful than elsewhere. Because I found here, near the sea, the little flowers that grow in the mountains in France. Because in summer in France the days are too short and in winter in France the days are too long. Because I see in Iceland you do not laugh at someone who has Parkinson’s disease, believing that he’s drunk. Because in France I finally write on my T-shirt: I’m not drunk, I’ve only Parkinson’s disease, and as stupidity, it is incurable. Because Iceland is the best place in the world to learn Icelandic. -Wherever I am in Iceland ! Because Icelanders refuse to pay for the mistakes of private banks! Because there are men and women who fly with paraglide in Iceland, when in France you can see that almost only men fly. Because Iceland is the first place for two years for gender equality, when France went from 18 to 42 and I am proud to have two daughters. Because it is 1137 years that people resist to survive on this beatiful island, because for 11 years pilots fly there with paraglider. Because the club of Reykjavik is dynamic and welcoming. Because I would like to help local pilots when they go to fly Landmannalaugar. Yves Mellet lives in Paris, France. From a young age he has been an outdoors/sports/adrenaline enthusiast. A few years ago he was struck with Parkinsons disease but has refused to let it stop him live his life! He stays active and positive, a role model for many healthy young men out there. See Yves fly in this YouTube video. Well, I didn’t fly in another country yet, but I would say, that the best thing about flying here in Iceland is that here are no trees, Icelandic weather forecast is very accurate so it’s easy to decide if its flyable or not, you can choose from many places where to fly; soaring at coastal ridges using sea breeze, soaring at the hills, flying down to bottom mountains… and it doesn’t matter from what direction the wind is blowing – you can always find hills in desired direction. What is your favourite flying site and why? I fly most of the time only in the North of Iceland and here my favourite places are mountain Hlíðarfjall, great place for N, NE, E winds, flying there you can see the whole town Akureyri from above with all the little farms spread all around, easy grassy slopes, just relaxed flying; and Húsavíkurfjallið at Húsavík, flyable N,NW,W,SW,S,SE, this is the place where I made my very first flight, so I am bound to this place, its about 1 hour of driving from Akureyri, but you will be rewarded with great flying with spectacular view over Húsavík and the fjord… with the north direction its an easy grassy slope, in south side its a suberb ridge; when you take off, you are just straight away in cca 400 m ABGL! The ridge actually looks like someone did it for flying with heavy machines… it’s a perfect angle, length, many safe landings around… simply the best place I have flown so far. Got to love the Icelandic power nature! 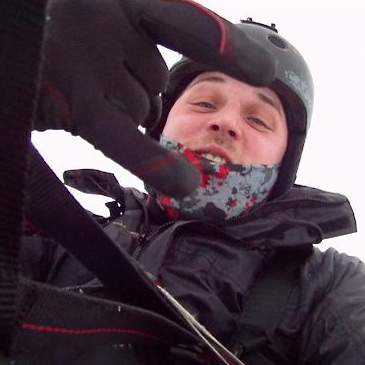 Pavel Landis Landa lives in Akureyri and has been paragliding since 2010. He learned with Gísli Steinar Jóhannesson at Svifvængjasetur Norðurlands.